Do you care? Do you dare? If you care, and I’m sure you do, that alone will do wonders. Just by caring you’ll do small things that add up. Maybe you’ll decide to change your mood for the better when you could easily stay angry, that effects everyone around you. Perhaps by caring you’ll listen to someone who needs to be heard and by doing that you may very well save a life, I’ve seen that happen first hand. By caring, you will do the small things that uncaring people don’t and those small things add up. Do you want to do more but don’t know what to do? Find something you care about and do something, do anything to help. I have an amazing friend, Craig who cared; Craig is just one guy but after the 2010 earthquake in Haiti he couldn’t sit back. He flew his plane to Haiti time after time bringing food and medical supplies when the bigger planes couldn’t land. He didn’t question what only one could do, he just got to work. He made the lives of others so much better and you can too. 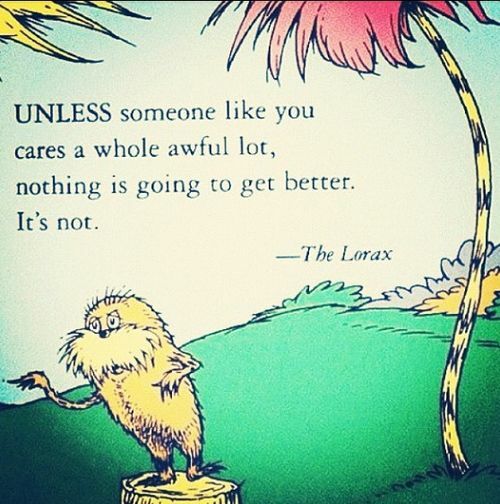 Keep in mind Dr. Seuss’s advice; things won’t get better unless someone like you cares.